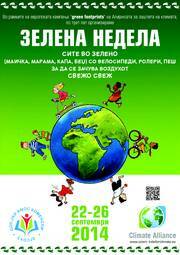 320 pupils from school “Jan Amos Komenski” from second till sixth grade were doing an activity week with the title "Green Week" from 22. – 26.09.2014. Together they collected 2892 green footprints and organized several different activities. This year they put their mainly Focus on the issue water. Therefor all water taps were replaced with saving water taps, which will contribute significantly to safe drinkable water. "It is an honor being part of this global action and in the same time I would like to express my satisfaction and my motivation for further and more aggressive action and affirmation of the campaign among the other schools in our country. This year activities were focused toward following and collecting green footprint, drawing as well as motivation of the pupils for more frequent use of renewable transport vehicles. The action week was called GREEN WEEK, and within the framework of this week, every day was dedicated to some of the renewable transport vehicles such as : bike-day, roller day, walking day. Writing eco- messages and songs. – pupils from 4th grade-Making poster for the activity week – pupils from 6 th grade"